Cruise around downtown San Diego during a leisurely 3-hour bike tour with an expert guide who shows you the best of this beachside city. Pedal along the waterfront, where you get clear views of the city skyline, San Diego Bay and Coronado Island, and take quieter streets through the historic Gaslamp Quarter and vibrant East Village. Your guide shares insider tips and informative details about San Diego's history throughout your tour. In the morning, make your own way to the designated meeting point in La Jolla to meet your guide. Your guide provides equipment including a multi-speed hybrid bike and helmet, then gives a short safety briefing before you set out to see the city. When you're ready, follow your guide along a bike path that traces San Diego's waterfront, an easy ride on a scenic and flat route that offers great views of the San Diego Bay, Shelter Island, Coronado Island and the Embarcadero. 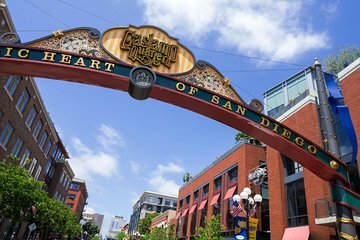 Then head into the lively Gaslamp Quarter, home to a great nightlife scene with excellent restaurants, bars and concert venues housed in both historic Victorian-era buildings and modern office blocks. Continue through the East Village, an area that has recently experienced revitalization efforts that attracted new hotels, boutiques and art galleries. Expect to ride approximately 6 to 10 miles (10 to 16 km) depending on the energy level and skills of your small group. The ride is considered moderately challenging, and principally follows dedicated bike paths with a few small hills. Stay energized with complimentary bottled water and snacks, and enjoy plenty of photo stops throughout the tour. You cover more ground by bike than on a walking tour, and you get to see the sights that you would miss on a bus tour. Your 3-hour bike tour ends when your guide returns you to your starting point, having gained a better feel for San Diego's downtown and ideas for places to visit on your own.